Source of Light-Ghana has a large and varied ministry. The work now has several full-time and volunteer staff that grade Bible lessons, counsel students, help with various outreach ministries, and care for administrative duties, as well as serving over 150 Associate Discipleship Ministries.In our effort to evangelize, teach train, and serve through the distribution of Bible Study Courses, we endeavour to embark on projects aimed at improving the living standards of the rural communities we serve. 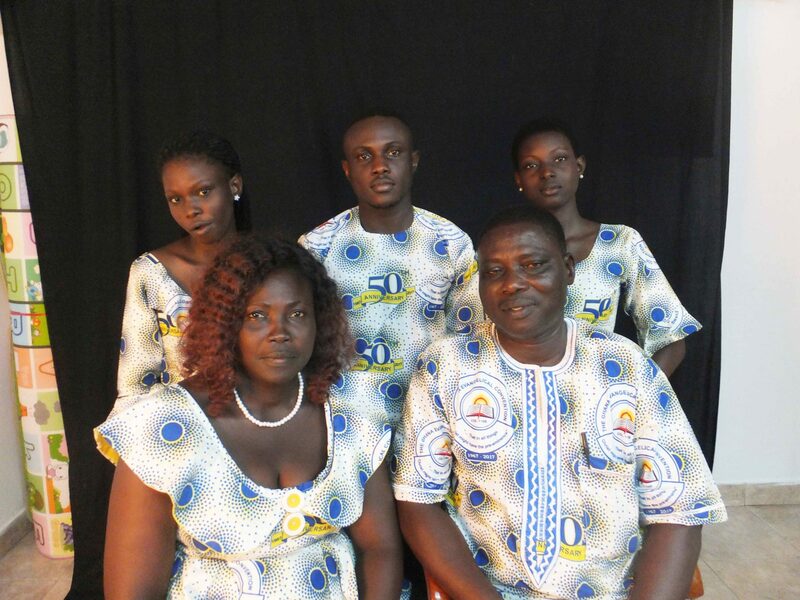 Daniel & Gifty Sappor with three children- Timothy, Wilma and Suzzy serving the Lord with Source of Light Ministries as National Director for Ghana, West Africa. Our ministry with Source of Light started in 1980 when I was serving with Child Evangelism Fellowship of Ghana as an Associate School Director. In 1996 the Source of Light Ghana Discipleship Training Branch was started with 17 Associate Discipleship Schools. Daniel Sappor was appointed as the National Director serving under a National Board of Directors. • In 2003, SLM Ghana moved into its permanent National Office at number 4 New Sempe High Street, New Mamprobi-Banana Inn-Accra. That same year, the Northern Sector Office was officially opened in Tamale to serve the three Northern Regions of Ghana. • In 2005, a 10 acre plot was purchased in Tamale for an Office Complex, Christian Missionary School and Campground to serve the three northern Regions of Ghana. The work now has several full-time and volunteer staff that grade Bible lessons, counsel students, help with various outreach ministries, and care for administrative duties, including serving over 250 Associate Discipleship School scattered all over the country. We use SLM Bible Courses in ENGLISH and few FRENCH Bible Courses as we are surrounded by French Speaking Countries. We are so excited about the impact of the lessons for evangelism and discipleship in homes, schools and church in Ghana. Many pastors and national missionaries in many churches testify about the truths of the Bible lessons they learned many years ago became a foundation which made their Bible very effective. 1. Operating a Discipleship School at our offices in Accra and Tamale where we also serve various Associate Discipleship Schools. 2. Outreach to both Private and Public Schools as well as Prisons with the Bible lessons. 7. Reading Disability Program, Computer Literacy Program and Job Training Program with evangelism and discipleship as its foundation. 5. Raise 50% of Yearly Budget locally through donations from individuals and churches as well as through income generating projects. 6. Open a SLM Ghana Distributing Center in Kumasi, Ashanti Region of Ghana.